Crouse-Hinds FlexStation™ 1-Gang control station back box measuring 3.5-Inch x 3.0625-Inch x 6.0305-Inch, features 1-Inch trade size. This through feed box is ideal for installation in petroleum refineries, chemical, petrochemical and other industrial processes. This box is ideal for use with DS441 and DS442 covers or with 1-Gang and 2-Gang DS/DSD series covers. It is also ideal to use in conjunction with magnetic starters or contactors for remote control of motors and other electrical apparatus. 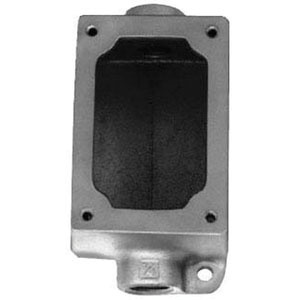 The through feed box is suitable for use with DS441 and DS442 covers, with 1- and 2-Gang DS/DSD series covers. The control station back box meets Class I, Div. 1 and 2, Groups B, C, D, Class II, Div. 1 and 2, Groups E, F, G, Class III, Zone 1 and 2 Group IIB, NEMA 3R, 7B, CD and 9 EFG standards.